Mobile apps are designed and created to run on several mobile devices which include tablet computers, Smartphones, notebooks and much more. The appearances and recognition of mobile Apps started as fWorld, Windows store and Goggle Play. These platforms have designed Mobile apps that are available to users for free and there are premium apps. They can be downloaded to desktop computer and laptops, but they are mostly made user friendly for mobile phones. With the current trend of marketing apps, it was estimated that at least 102 billion apps will be designed and downloaded in 2015. This is a substantial stand that the Mobile Apps market is always in flux. This rapid improvement and development is very surprising as Mobile Apps were initially and originally designed for knowledge retrieval and productivity coupled with emails, contact exchanges, calendar and weather data. The Mobile Apps industry continues to grow. There are countless contending Apps in the Mobile Apps industry. The industry is becoming so vast that the search giants and big organizations are now looking to gain from the advantages of Mobile Apps. This can be seen when Google, Yahoo, Bing and others recently stated that a mobile friendly website is a necessary item to rank better on their page ranks. The industry has been filled with apps designed for unique purposes. Some of the categories of Mobile apps include games, travel, health, making money and education. These categories have experienced varieties of competing app seeking to gain more recognition and views. These competitions have prompted many organizations and businesses to seek more waysto gaining more insight, impressions, views, downloads for their apps. What are the best methods for marketingan App in this kind of competitive environment? What does it take and how do we create good impressions about our app? How do we get the masses to talk about and download our app? Marketing requires strategies and ways that require patience and virtually little or no money. 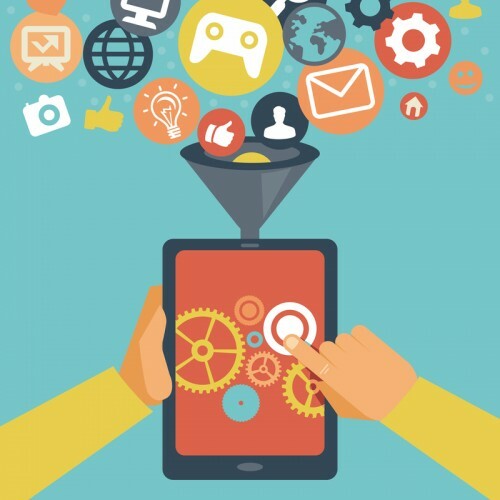 Marketing your app starts the moment your idea of mobile app goes into production. Being unique will make you stand out in any App store or category your app falls into. It has been estimated that apps are developed and designed without much inspiration for quick money. Marketing apps can be done via SEO (Search Engine Optimization). SEO has techniques and elements. The elements include videos, images, contents, keywords and many more. You can fully optimize and market your mobile apps by getting a microsite designed for the app. After the successful creation of the microsite to market the mobile app, the element of SEO can then be incorporated into the microsite. This will in turn help to rank mobile app microsite higher on search engines. The mobile app marketing microsite should contain a short video of the app’s description, the HD logos and app icons, apps screen shots and many more. The SEO (Search Engine Optimization) of the microsite helps in marketing mobile apps by driving traffic to the app store for a lot of downloads. With SEO (Search Engine Optimization), you also have the advantage of marketing your app by linking a blog to your App’s microsite. Blogs are quickly indexed by top search engines easily. With fresh and unique contents about your App and its features will help with getting more downloads and marketing your app as well. Blogs can be easily implemented by using free services such as WordPress, Blogger, and Tumblr. There are many social media platforms that marketing apps can be done easily. Top platforms like Facebook, Twitter and LinkedIn among others are great for marketing apps. You can share and post your blog post to get comments from active media audience. Ask customers to leave ratings for your app because the more positive ratings your app gets, the more the chances of high downloads. This can be done by encrypting a code which asks for user rating in your app. Contact information is very essential too, you can ask reach out to unhappy customers and any inquiries and suggestions. Marketing an app involves thinking outside the box, but it requires time, patience and creativity. With these qualities, you can keep your eyes on thelookout for a million downloads. Carson Barker is a business owner, marketer, entrepreneur, and thought leader in the digital marketing industry. He founded APPSPIRE.me in 2009, and turned it into one of the leading mobile app marketing agencies in the world. His clients have been featured in the New York Times, Wall Street Journal, TechCrunch, Mashable, Fox Business News and more.